These little tables are adorable. I bought two of them to go on either side of a daybed. They are very unique and look great. Arresting shine and eye-catching design make this table a fantastically unique addition to your interior decor. A one-of-a-kind handcrafted work from artisans in India, this copper table has a distinctive presence in any space, delivering dimension and splendor wherever it is placed. This is again the handicraft work that has been created and launched after making several other patterns, this all included handicraft work and involves lots of labor: skilled labor who has experience and knows how to do it symmetrically. And then we decided to have copper finish and finally it looks good in copper. Beautiful, unique design, one of a kind! A very unique copper hand made side table or stool! Could be used as either or both. Made in India and the quality is amazing. Bought this for my husband as I am trying to give him a upgrade in "different, eclectic styles". He LOVES IT- really he does! Very happy with this purchase. Just lovely. I absolutely LOVE this accent table. It is so unique and easy to use in many places. I liked it so much I bought 2 more! This piece is beautiful and makes the whole room "pop"! This table is exactly what i was hoping for. Only thing is it is lighter than I thought but still looks great and is a great accent to the living room! This copper stool is a classic curvy shape and perfectly sized to hold a cup of coffee or beverage. Very shiny copper finish with unexpectedly gorgeous hand tooled design☺. I love copper and appreciate the coated finish on this solid copper piece. Frankly, I am stunned at how beautiful this stool is...especially since I bought it to be used as a functional side table. Function and beauty! Great purchase!!! I'm very happy. A quality piece of ornate work of the artisan's from India. This seller has done their research and found that this copper table will not tarnish when used indoors. Nice size and weight to this table. I see they have added additional finishes as options, but for me the copper is the most attractive. The only thing I wish is it be a little taller, it looks squat and I think adding a couple inches to the height would make it even more attractive. I bought this to use as a side table in a bedroom, the color is beautiful. It is very lightweight and works perfectly for the use that I wanted it for. The design is very pretty and it would also make a great plant stand. Eventually I would like to order another one and have matching stands. It is well worth purchasing and a great value for the money as I have priced these much more expensive. This is a great side table! It is exactly how it is in the pictures, the only thing is that it is a bit smaller then I though it was so make sure you measure if your looking for something different. Gorgeous accent in the living room. Versatile, Christmas tree sat on it. A beautifully made piece. It is very shiny - I would prefer a little more patina, but, It makes an an interesting and unusual accent table. Shipping was very fast. Very happy with the purchase. 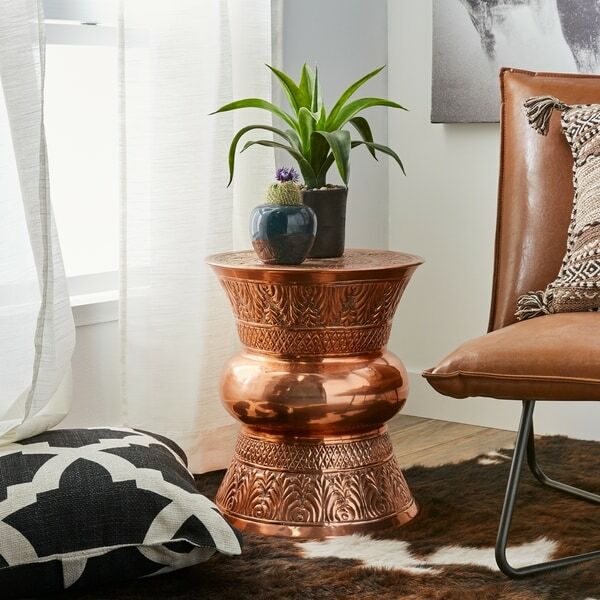 The Hourglass copper end table is very contemporary and I use it as a plant stand along with other sizes and types of pedestals for a grouping of a variety of different plants. Love this table so much, I bought another one! It's beautiful, distinctive and we'll made. Thanks Overstock! This was a 'splurge'; certainly not something I needed, but I truly wanted. I'm so glad I ordered it. It is a beautiful accent piece and looks lovely with my overflowing fern perched on it. Good quality and a great buy. Go for it! Looks just as advertised. Very bright coppery look and pretty design. I wish it was a little wider but all in all I am very happy with the look of it. These tables are very beautiful. I love the copper. They are not as high as I needed them to be. I kept them anyway, because I didn’t want to go though the hassle of returning them. love this little end table! its so pretty and detailed! it gets a lot of compliments. "Is it sturdy or is it lighter than it looks? I saw this maybe a month ago & decided to order it when I got paid the following week, but it was sold out! I'm hoping they'll restock soon & not opt to discontinue because I'm in love with the way these look by the picture but would like to know if it's a good quality." Very lightweight. Tin plated copper. Beautiful but dents easily. To me, it seems quite sturdy, although it's not heavy to lift. I wouldn't hesitate to put something heavy like a television set or a heavy plant or planter on it, and I can sit (or even stand) on it with no problem. "I have received this table. No problem or damage in shipment. The question I have is that there is some sticky residue around the perimeter of the round part of this table. It seems like it is the sticky part from shipping tape. There was no tape placed in this location when I unpacked the table. With the table being copper what do I use to clean the table of this residue without damaging the finish on the table?" Have you tried a commercial cleaner? Beauty and versatility. Along with great price and free shipping. "ITEM# 20061393 Will this copper table tarnish if it is used inside? I have some Moscow Mule mugs that are a copper finish on stainless steel made in India and they have not tarnished in 2.5 years." I've had this item for about two months and it hasn't tarnished. "How heavy is the table? " "Will this rust or darken if used outside for patio use? Thanks for helping." Humidity should affect this finish. "can this be kept outside?" It is an indoor product and will tarnish outdoors.